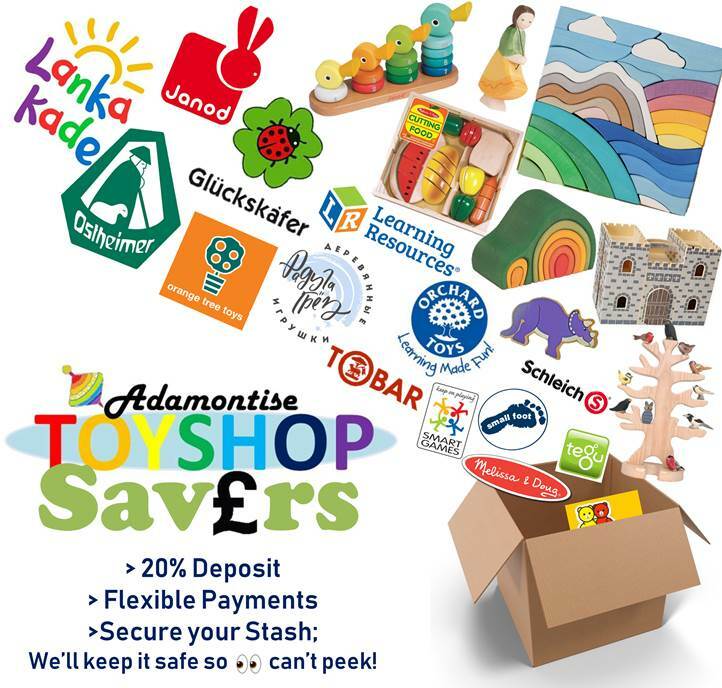 Spread the cost of big purchases with our Toy Savers Club. Maybe you've finally found your DISO but payday hasn't arrived yet, or if you want to save up for Christmas, Birthdays, Eid or any other celebrations we'll help you to spread the cost of larger purchases. We ask for a 20% non-refundable deposit to secure your items, and are happy for you to make flexible payments to suit you. We suggest that birthday plans are paid for within 4 months, that christmas plans are paid for no later than the 1st of December to ensure you get your toys in time - but we are happy to discuss options if you want to pay off quicker, or need a little more time. Add lovely toys to your basket. Applying the code changes the basket total to the deposit amount. We’ll then send you an email asking how often you would like to add funds and other little details.We can set you up with weekly, monthly or more flexible payments. This email is your chance to open up the conversation and it isn’t an auto-generated one being read by a machine, feel free to make suggestions and tells us how you’d like to personalise your saver plan. Once all the details are worked out and your plan is personalised to your needs and your schedule, we’ll send a paypal invoice with a partial payments option enabled on it. If you use code BIRTHDAYSAVER, we suggest that payment will be due in 4 months. If you use code XMASAVER payment will be due by the 1st of December to guarentee shipping for Christmas. If you use code PAYDAYSAVER we suggest that payment will be due within 1 month. Again, the length of all saver plans is negotiable and we’d be happy to work around your own needs. Once you've paid in full, we'll ship your order. No need to find a hiding place, ban people from using a certain room or block the garage door. We’ll even ship to you in unmarked (or covered up) boxes for additional discretion if you ask us to. If at any point you wish to add additional items to an existing Savers plan, please repeat the steps above to secure your items and pay your deposit, we will then add the remaining balance to your existing invoice. If you wish to have two separate Birthday Savers running for two different due dates, just express this when you recieve our email and we’ll be happy to help you. By choosing a saver plan, you agree to the T&C's below. No other offers, codes or promotions can be applied to Saver Clubs. Due to the nature of mystery boxes, they cannot be added to Saver Clubs. The product price on your order is final, even if some of the prices alter during the course of the year. Your order will not be dispatched until paid for in full. We aim to dispatch your order within 4 working days of being notified that you have paid off the balance. We reserve the right to decline saver applications. UK residents only at the moment, (sorry). A deposit of 20% is due immediately. You may cancel for a full refund within 14 days, after this time if you cancel, your 20% deposit will be non-refundable. If the balance is not paid within the timeframe shown on your paypal invoice, you will be contacted to check you are aware, if we cannot reach an agreement your order will be cancelled and the deposit will not be refunded. You may recieve Paypal reminders during the length of your Saver plan, please just view these as helpful reminders - they are an automatic setting and cannot be turned off. There are no returns on saver items, if an item is damaged during shipping we will issue a replacement where possible, otherwise offer an alternative or refund.